We will provide fast, efficient roof storm damage repair services so your home is protected once more in Innisfil. No matter what the scope and size of your roof damage may be after a storm, you should always leave the storm damage repair up to our professionals at Slippery Slope Roofing. Having a qualified roofing company on your side when you have sustained damage to your home during a storm is beneficial for a number of reasons. Not only can we make sure to provide accurate assessments of the extent of the damage, but we can also help you keep your insurance company well-informed and provide the storm damage repair solutions that you need. Your roof is something that provides an essential safety and security function on your home, and storm damage to any part of it can create multiple problems. Not only do you have to deal with the external damage caused to your roof, but you may also experience the internal damage that comes with rain water or debris that finds its way inside. 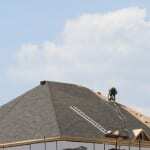 At Slippery Slope Roofing, we know that dealing with storm damage repair to your roof constitutes quick action, and we will provide fast, efficient services to restore your roof so your home is protected once more. The good news is that you don’t have to deal with storm damage repair in Innisfil, Ontario on your own because you’ll find our team at Slippery Slope Roofing ready and willing to assist you. Whether you have hail damage, a tree has fallen, or you have some other type of storm damage affecting the safety and security of your home, contact us today to get started with the repair process.